Lock in a great price for Celebration Suites – rated 8.2 by recent guests! The size and space in the rooms were great. Lots of closet storage and spacious. Large suite came as a no cost upgrade which I didn't ask for. Suite was very large with plenty of bed and bath options. It would be perfect for a large family group. Liked the ease of getting to WDW, it was a quick easy drive. We didn't eat breakfast but it was very quiet and pleasant and all the family loved it and our son didn't want to leave. We will be back cause this is the only place I've stayed since I was a little girl and back then it was Days Inn. Conveniently located to the parks and old town. Well worth the money My only negative is would have liked to have been closer to the front of the complex it is extremely big and a little dated we were in the very back. But overall it was a good stay clean and affordable. Loved the adjustable shower head with handheld. All dishes, utensils and pans were there. Loved the full size fridge and cooktop. Parked right by our door. Unit was well worn, but comfortable. The room was very spacious and the bed was very comfortable and was in good location of the old town . Overall, we loved this property and will stay again. 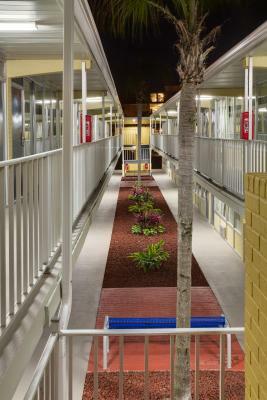 The location is very convenient to everything including airport and theme parks, food stores and local restaurants. Completely pleased with this experience and will most definitely stay here again. Celebration Suites This rating is a reflection of how the property compares to the industry standard when it comes to price, facilities and services available. It's based on a self-evaluation by the property. Use this rating to help choose your stay! 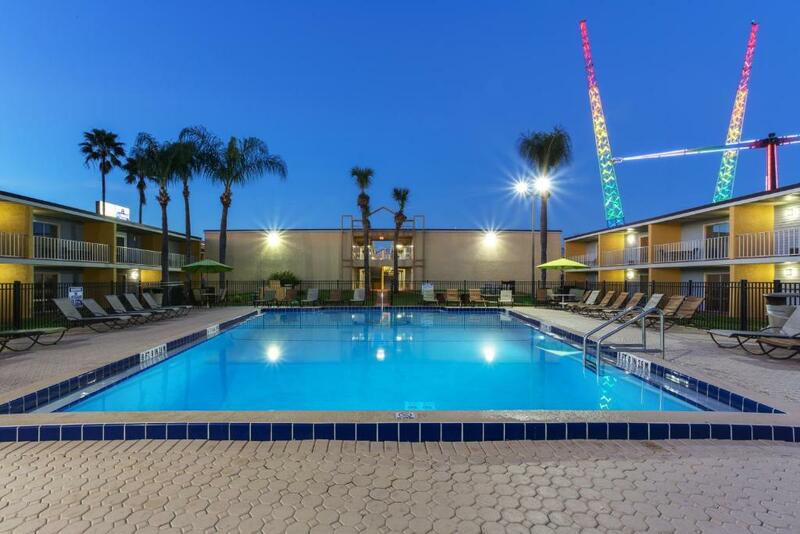 This family-friendly hotel offers spacious suite-style accommodations adjacent to the Old Town Entertainment Complex and 2.1 mi from Walt Disney World, with convenient access to other attractions. Free WiFi is provided throughout. Celebration Suites feature full kitchens making it easy to eat a quick lunch before exploring one of the area's famous theme parks. Enjoy separate living and sleeping areas, great for entertaining guests or relaxing. 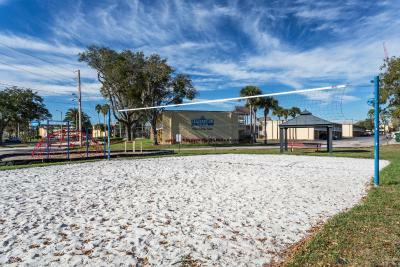 Guests at the Celebration Suites can play volleyball in the outside sports courts. 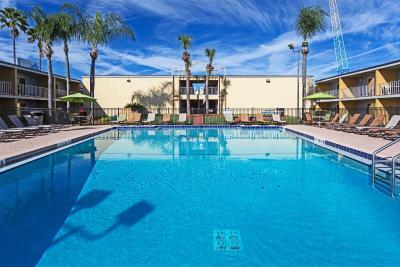 The property also offers 3 outdoor pools. Guests can play in the indoor game room or make dinner in the barbecue area. The hotel offers complimentary transportation to Walt Disney World, Universal Studios and SeaWorld. Ticket service to local attractions is also available. SeaWorld is 8.8 mi from the property, while Universal Orlando Resort is 12 mi away. Orlando International Airport is a 24 minutes' drive away. When would you like to stay at Celebration Suites? This room features a kitchenette with a microwave, refrigerator, and a dishwasher as well as 2 TVs with cable and the HBO movie channel. This villa is located near the pool and features a private balcony, cable TV, a fully equipped kitchen. A microwave and refrigerator are also included. This villa features a kitchenette, a private balcony and a separate seating area. There is also a TV with cable for guests to enjoy. This suite has a stovetop, kitchen and air conditioning. A microwave and refrigerator are also included. This suite features air conditioning, cable TV and stovetop. A microwave and refrigerator are also included. Hotel surroundings – This neighborhood is a great choice for travelers interested in Disneyland, tourist attractions and family-friendly trips – Check location Great location - show map Guests loved walking around the neighborhood! House Rules Celebration Suites takes special requests – add in the next step! Celebration Suites accepts these cards and reserves the right to temporarily hold an amount prior to arrival. A cash or credit card authorization for security deposit is required per room and will be taken at check-in. 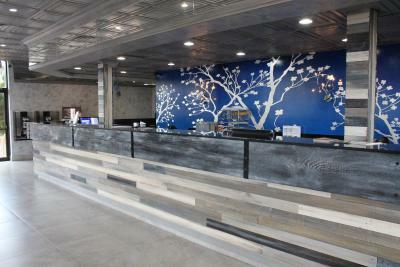 Please note the property will authorize the first night's rate on the guest's credit card 72 hours prior to check in. This is to confirm the credit card and hold the reservation for the guest. The larger unit. Really needs an, additional bathroom. The space in the unit. Furniture was a little dated and the showers were a special misting type. It didn't bother me so much, but my wife would have preferred stronger showers. I thought the location was excellent. It is a short drive to Disney and next to a little amusement park and outdoor mall, perfect for walking around with my child after a long day of driving. The staff were very friendly as well. My room had a coffee maker and they kept the coffee stocked. The mattresses were very stiff and the beds made a lot of noise when moving on them. Everything was clean good people and the gym had everything. I didnt receive room service for 2 days cuz I left my puppy free out of the cage. We didnt receive no information on pet policy nor did the house keeping let us know in a note or anything. The house keepers dont speak any English and the staff speaks broken English which I hate because they should speak English if they want to live and work in America. Worst experience ever! Will make sure I tell everyone to not stay there!! Waist of $500!! Garbage bags were too thin and the shower head was a mist. Wait to check in was too long for the few people who were checking in. Rooms are basic and in need of updating. Mold infested rooms. I've been sick ever since I left the property. they need better cable system it was trash you dont get good tv station .. It would have been nice to have two bathrooms.